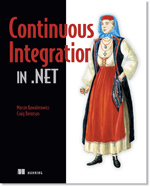 More on "Continuous Integration in .NET"
I will be speaking on Wednesday (20.01.2010) in Krakow, Poland at the Karkow .NET Developers Group meeting. The session is about Continuous Integration in .NET. So if you like hear what I have to say about CI meet me at ABB ISDC, Pałac Pugetow, ul. Starowislna 13, Krakow at 18:30. I believe the attendance is free but registration is required. See you in Krakow!